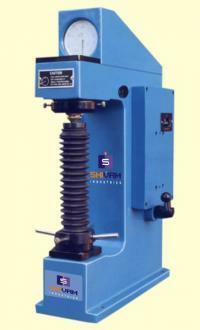 We are ranked among the most credible Manufacturers and Suppliers of Rockwell Hardness Testing Machine in India. 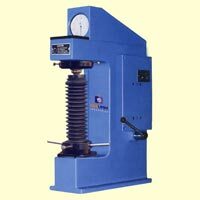 All the models of Rockwell Hardness Testing Machine are suitable for testing hardness of metals & alloys of all kinds - whether hard or soft, flat, round or irregular in shape. 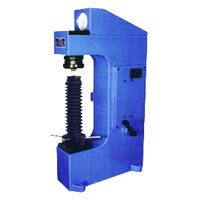 Rockwell Hardness Testing Machine is simple in design, easy to operate, and quite sensitive. 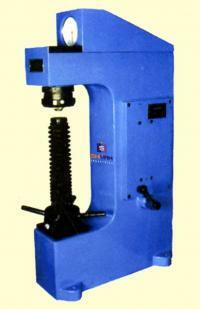 Rockwell Hardness Testing Machine is used in schools, laboratories, tool room, inspections departments, industries etc. Similar to 187.5 â�� SHI â�� RBM â�� I, but bigger capacity Diamond Holder is guided in set of two ball cage, which enables testing of small pins having diameter less than 6 mm ( up to 3 mm diameter).